Friend, the Pittsburgh Parks Conservancy is your non-profit partner in the parks. 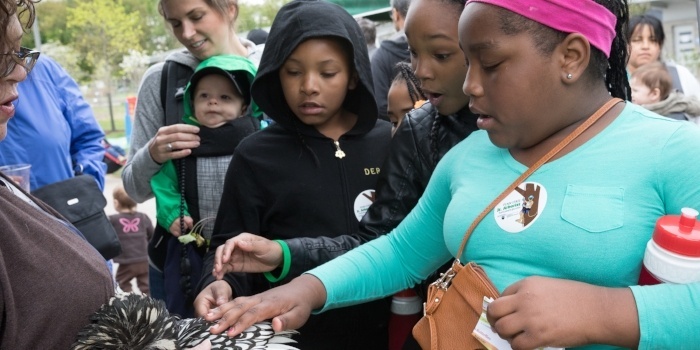 Whether we're planning turkey-themed hikes, young birder get-togethers, or community meetings, we’re committed to making your life better through vibrant, healthy parks. Unwind those scarves and pull on some warm socks - we have tons of fun, free events for you this month. Plan to meet a friend, take a walk, or join us for a number of all-ages events that we have planned. >> Click here for our full events calendar. Park pal Sha remembers when Schenley Plaza was just a boring old parking lot. Years later, it was transformed into a magical greenspace where she often took her young daughter Sylvia. "My daughter, Sylvia, grew up by Schenley Park and took her first steps there," writes Sha. "I'm so glad Sylvia could grow up here; she's now in her third year at Pitt. I know that no matter where she goes in life, Pittsburgh and the parks are a part of her." In thinking about your own unique park moments, we hope that you'll consider a donation during our year-end campaign. Your support keeps parks growing for years to come. >> Click here to join Sha and Sylvia in supporting your parks. As Thanksgiving approaches, we're grateful for another great year for Pittsburgh's parks. Have stories and pictures from this year in your favorite park places? We would love to hear them! >> Share your park stories and pictures here. In design and mission, the Frick Environmental Center incorporates seven Living Building categories, or 'petals': place, water, energy, health, materials, equity, beauty. Events at the Center this month center around the theme MATERIALS. Every material used in the Center was intentional, having first undergone an extensive vetting process; all were sourced from responsible industries, many recycled or locally produced. Elements like black locust siding and interior furnishings made from locally salvaged wood are a nod to native tree species. >> Learn all about the Center here.